Fast food workers have been fighting for a $15 minimum wage for years. 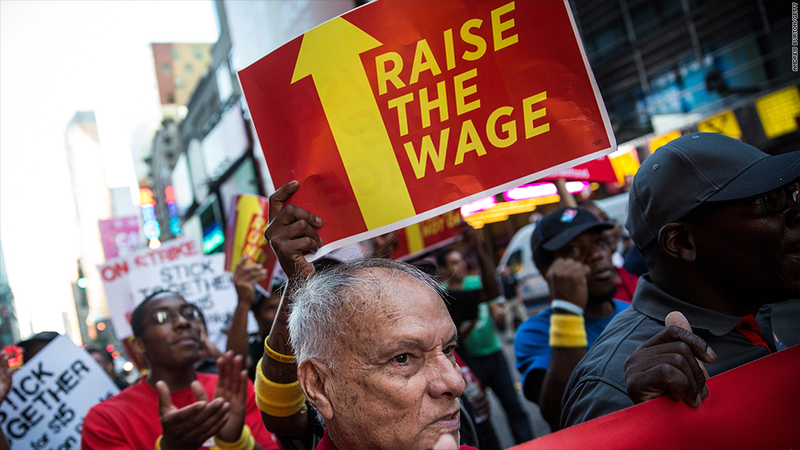 Fast food workers in New York are another step closer to a $15 minimum wage. On Wednesday, the state's wage board recommended that the minimum wage for fast food workers should be raised to $15 an hour. New York's minimum wage for all workers has risen from $7.25 to $8.75 an hour in the last two years. By the end of this year it will be $9. The board recommended that wages in New York City should hit $15 by December 31, 2018, and be at that level in the rest of the state by July 1, 2021. The wage recommendations are aimed at fast food chains with 30 or more locations. The wage board was created in May at Governor Andrew Cuomo's request. It's held four meetings throughout the state, listening to "hundreds of people and reading written testimonies from over 2,000." Next the wage board will submit a formal report to the state's Labor Commissioner. He then has 45 days to accept, reject or modify the recommendations and enact the increase. "It's long past time for New York to catch up with the times and raise the wage -- because it's vital to lifting New Yorkers out of poverty and moving our economy forward," New York City Mayor Bill Deblasio said. "The Wage Board's recommendation of a $15 minimum wage for fast food workers marks a critical first step toward that goal."